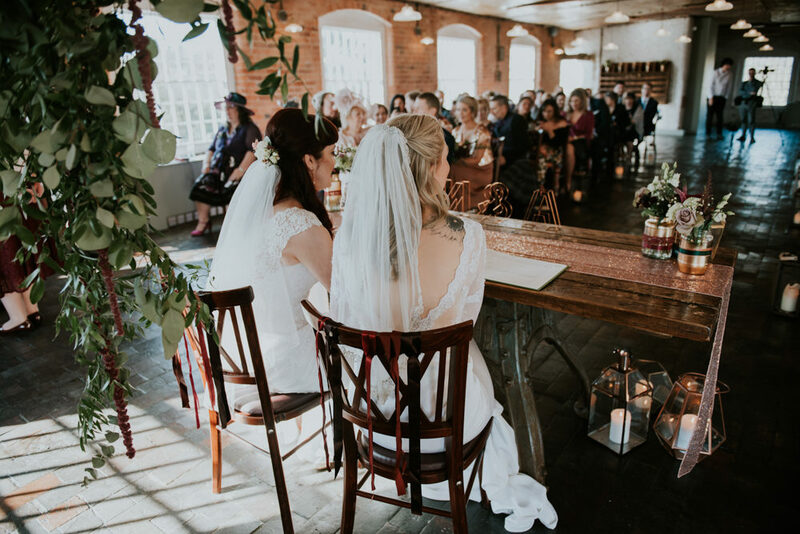 There isn’t one part of this gorgeous industrial wedding at The West Mill in Derby that you’re not going to love. 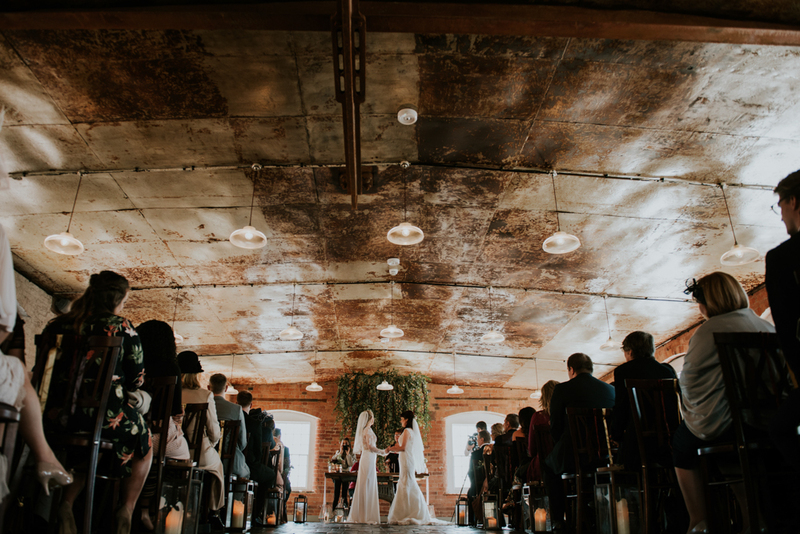 The venue itself is jaw dropping with its exposed bricks, hanging pendants, and large open space. Add the styling talents of The Vintage House That Could with lots of lovely travel and adventure decor and props, and your pinning fingers are going to be twitching. 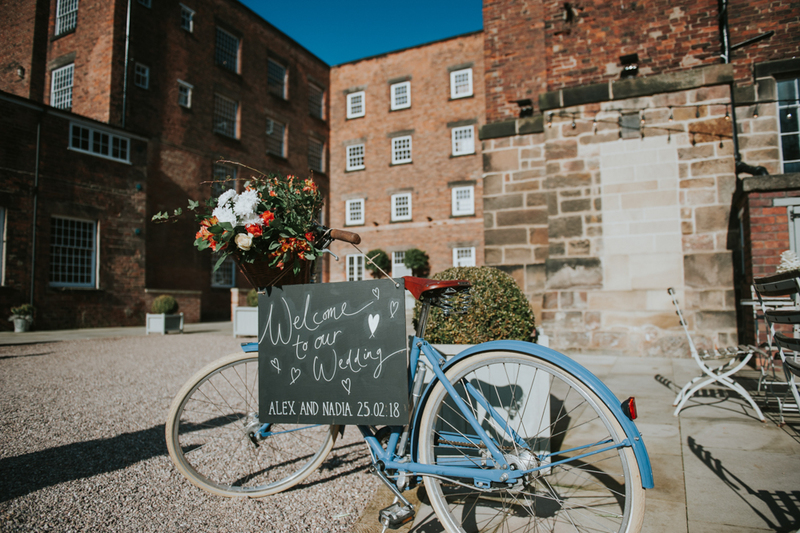 But is it any wonder the theme is so fabulous when our two stunning brides Nadia & Alex are both textile and furniture designers. 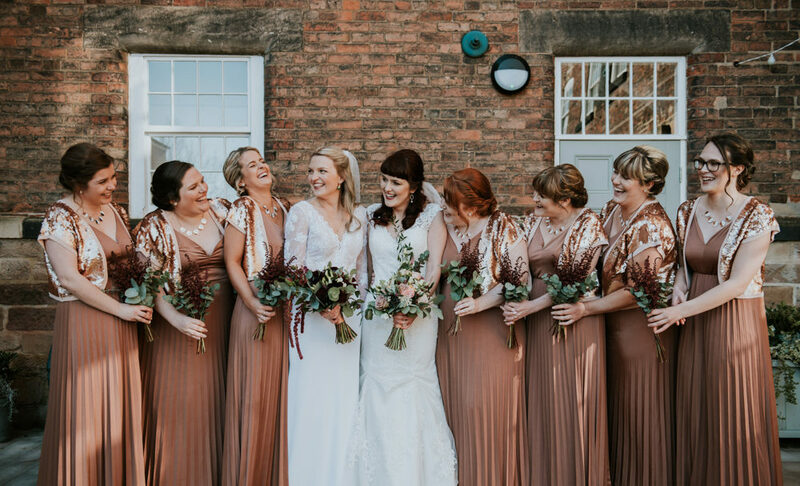 There are lots of more copper details to feast your eyes ups, including the bridesmaid ASOS dresses and coverups, plus an immense greenery installation by Vanda Vase floral design, framing those adorable vows. 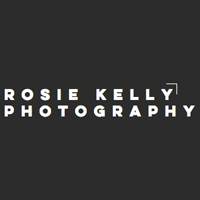 Capturing all the love is Rosie, who made sure every emotion is felt and treasured in her stills. 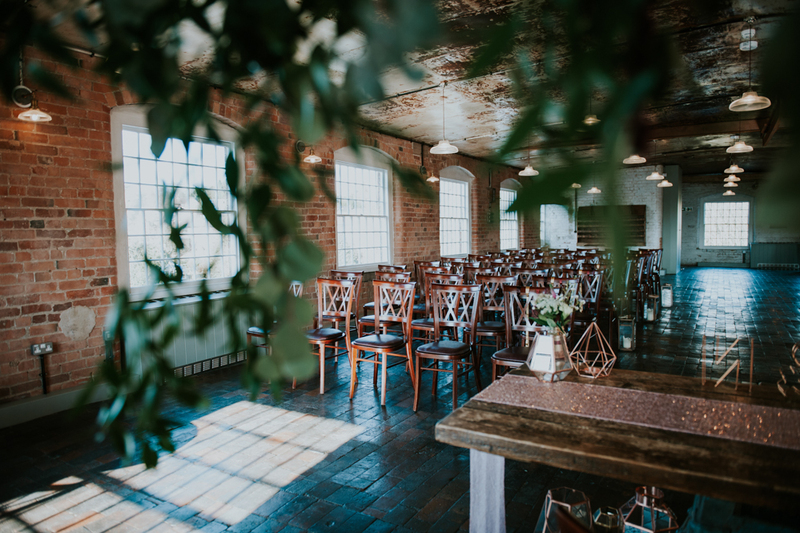 And if you’ve fallen for this industrial venue as much as us, take a look at these lovely real weddings too. Elegant black tie weddings are fast becoming one of our favourite looks on RMW at the moment. First adopted by our American friends and finding their way over the Atlantic ocean to grace our beautiful wedding features too. 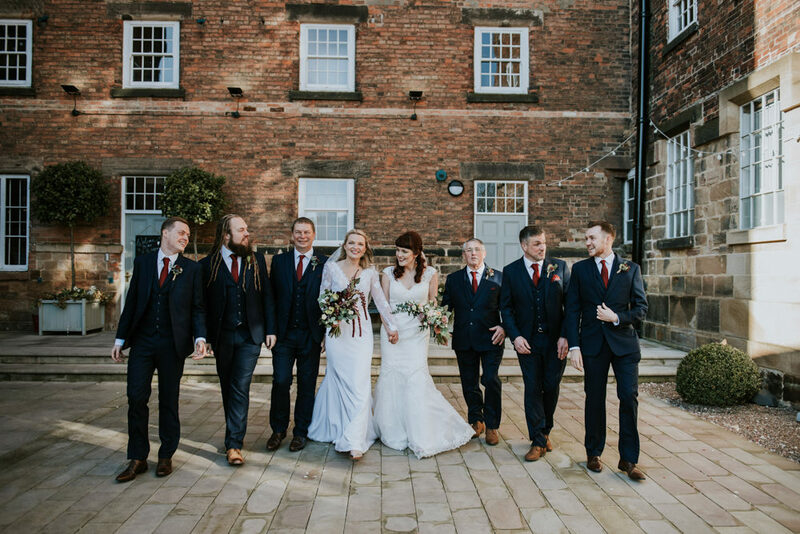 The groomsmen opt for dapper tuxedos and the bridal party gowns are always absolutely jaw dropping. This is certainly true of bride Charlotte in her lace Badgley Mischka wedding dress with detachable train. Seriously, wow! 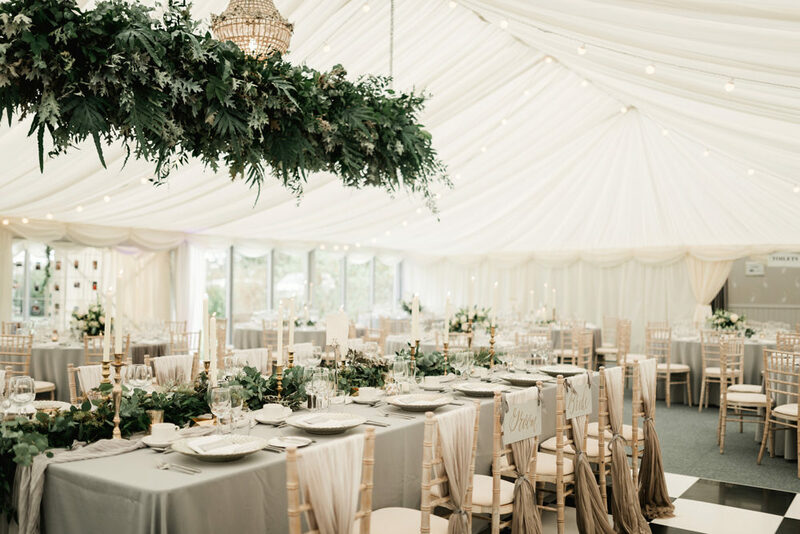 Charlotte and Paddy compliment their attire with a timeless grey, white, greenery and gold colour scheme, and together with Mood Events and Floralearth they style the marquee at Tullyveery House in N. Ireland with epic results. 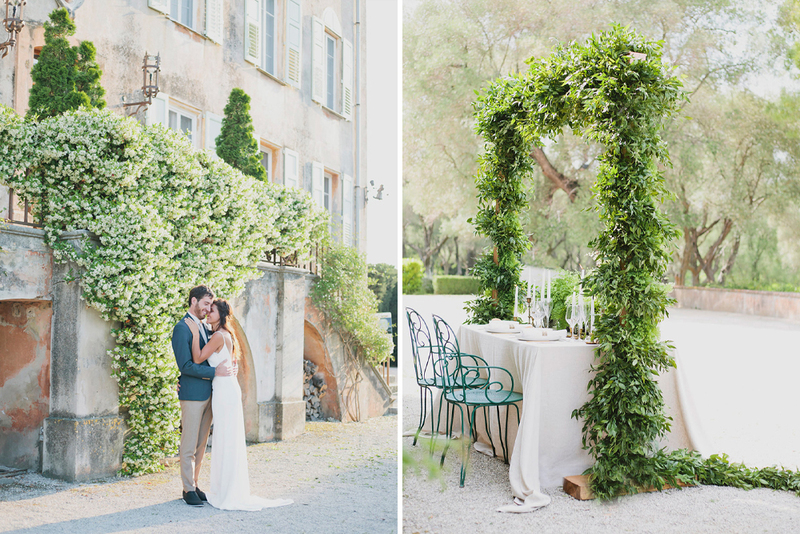 Think greenery table runners, hanging installations and romantic taper candles. 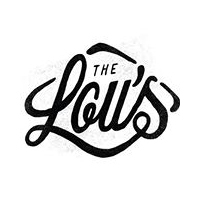 Now get those pinning fingers ready because The Lou’s have captured it all to perfection. We’ve not shared any images by the lovely Adam and Grace Photography before, but I hope we do again soon as they capture so much detail and emotion, I almost felt like I was there celebrating alongside this lovely Irish couple at their destination French wedding. Now are you sitting comfortably? Because you are about to have your socks knocked off. After falling in love with the incredible floral creations of Philippa Craddock at the recent Royal Wedding it felt only right that we work with our amazing, handpicked wedding suppliers from The List to bring you both inspirational and achievable ideas taking inspiration from this romantic and elegant look. 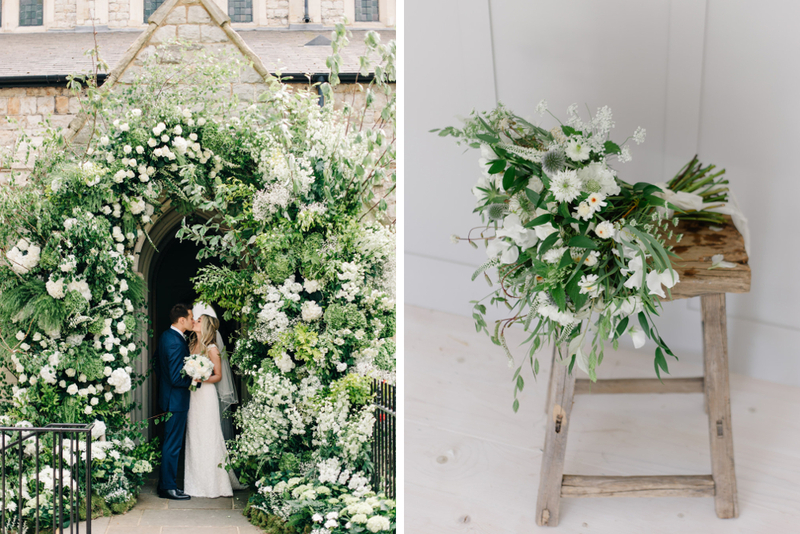 I think you’d be hard pushed to find anyone, anywhere who failed to swoon over that stunning green foliage and white floral archway at the west door of St George’s Chapel and who doesn’t want a bit of that swoon on their own magical day?! 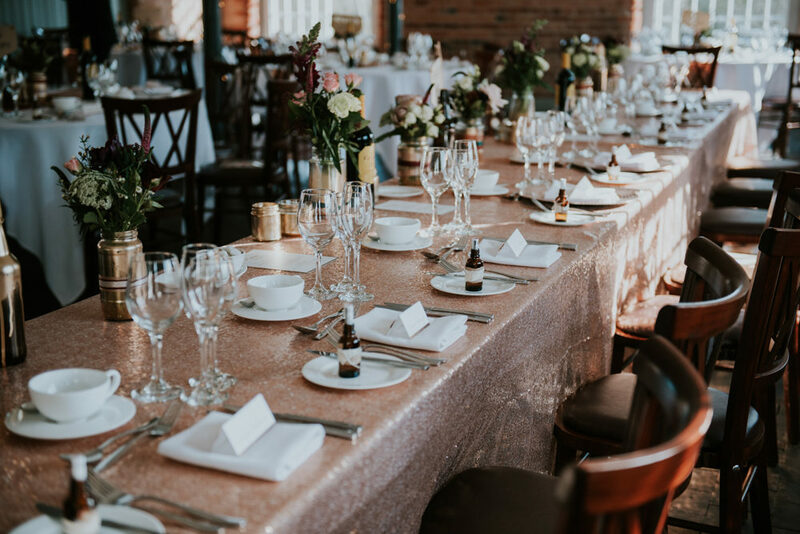 Whilst Summer styling often includes pastel hues and rustic decor, today we’ve gathered inspiration for a somewhat more understated, refined look (aside from the flowers of course, they are off the chart) which should no longer be reserved for destination weddings. 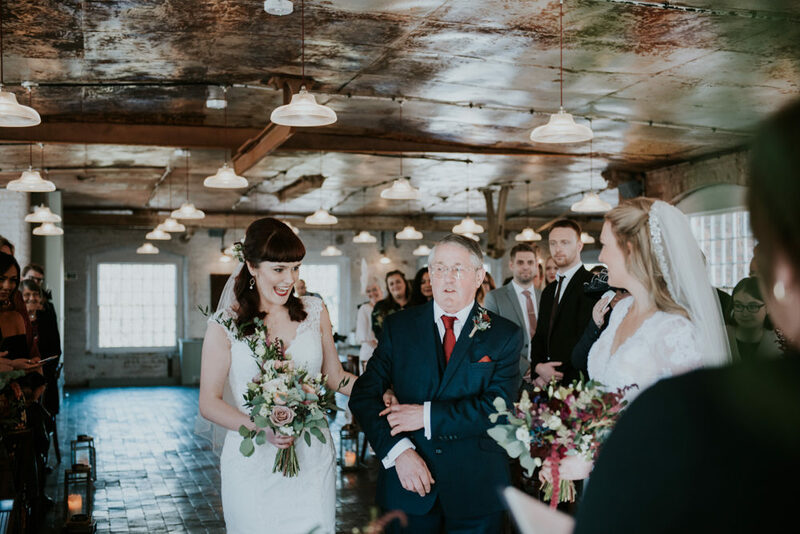 The self titled ‘Wedstival’ of Emma-Jayne and John at Pimhill Barn in Shropshire is absolutely amazing from start to finish. 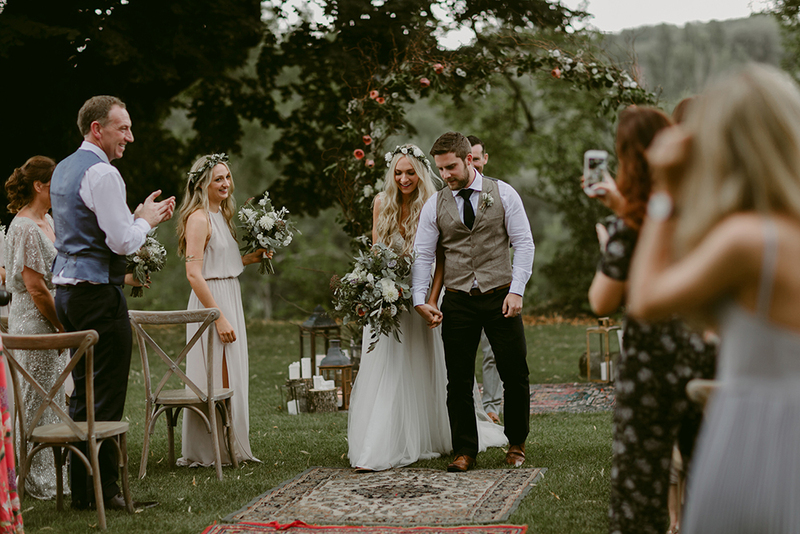 I knew from looking at the first image captured by Clara Cooper Photography that their wedding would be fit to bursting with stunning details, fashion and foliage, not to mention emotion. 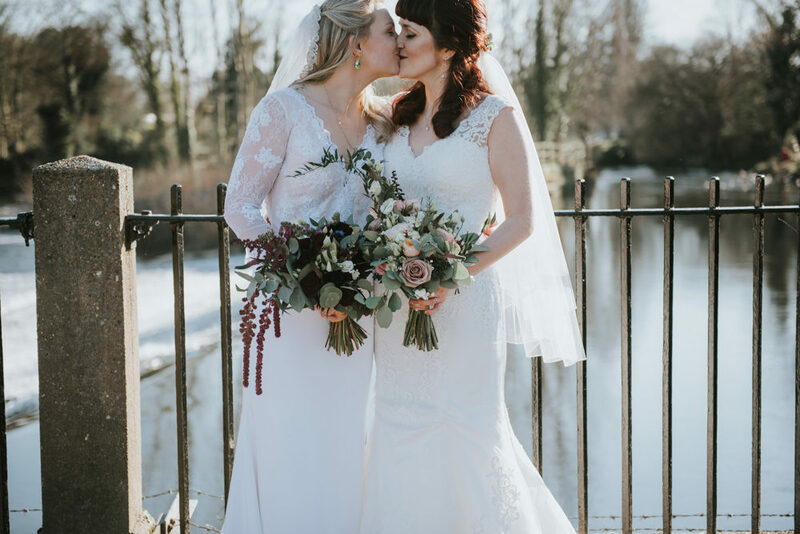 The embellished detail on Emma-Jayne’s Needle & Thread gown is truly exquisite and catches the light beautifully at the outdoor ceremony and speeches. 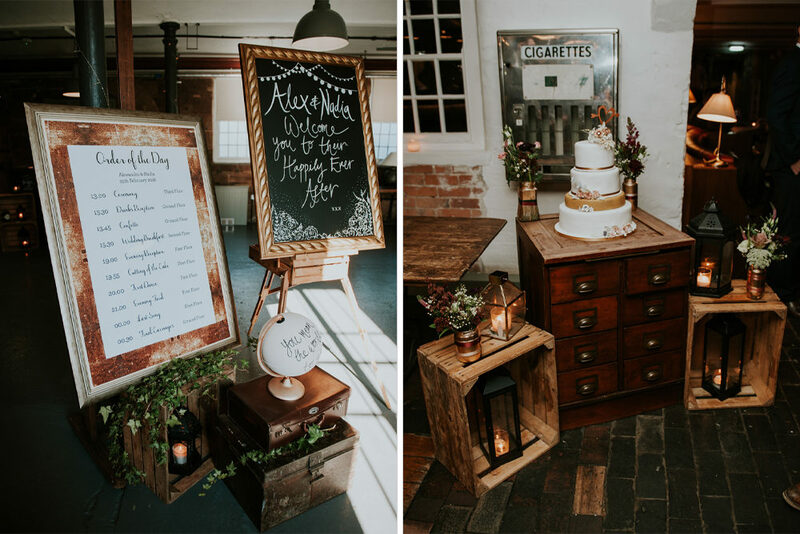 I’m in love with the wooden bar, the semi naked cake and don’t even get me started on all the lush greenery florals adorning all this fabulous wedding decor. The whole day looks an absolute dream, especially the festival survival packs full of glitter. Where can I get one? Make sure you are sitting comfortably, because this wedding deserves your undivided attention. 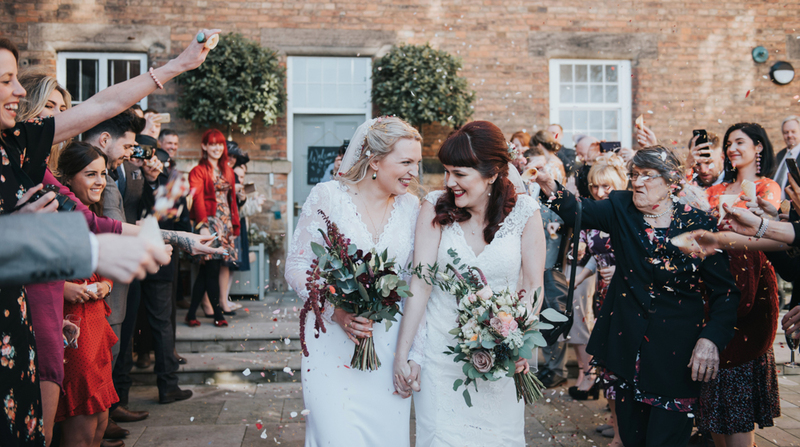 There are SO many stand out details at this Norfolk countryside wedding, so hold on to your hats while I give you a little run down. 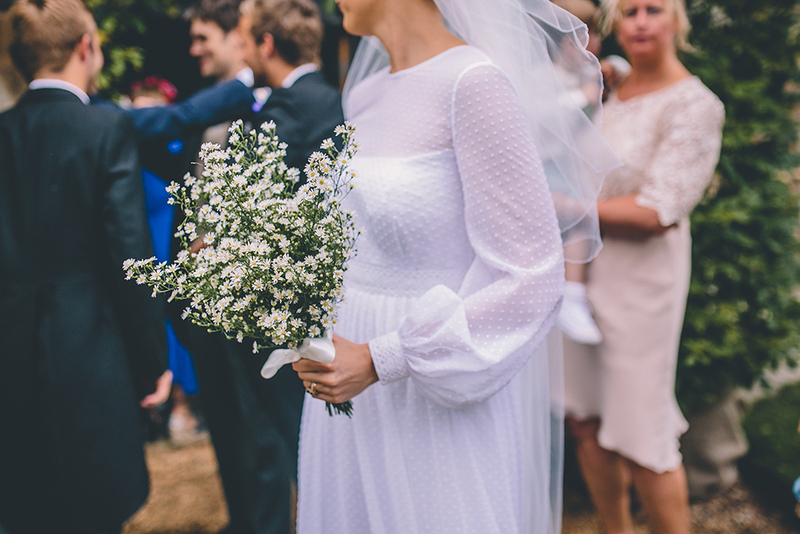 Firstly Bride Lucy’s heirloom tiara, literally the crowning glory to her understated, but incredibly pretty polka dot tulle gown by Eponine London. Then there’s the lemon arch & tree’s decorating the church. Seriously WOW. Now onto the entertainment, which included a fly by, a light show and a fireworks display, as well as various bands, an epic underground disco, chilli cocktails and BBQ’d lamb. See I told you it was good. Capturing all the amazing-ness was RMW faves Story + Colour who makes you feel like you are right there celebrating with this gorgeous couple. Get ready for a sunny coastal wedding in South Africa that exudes love & happiness, and an abundance of style. 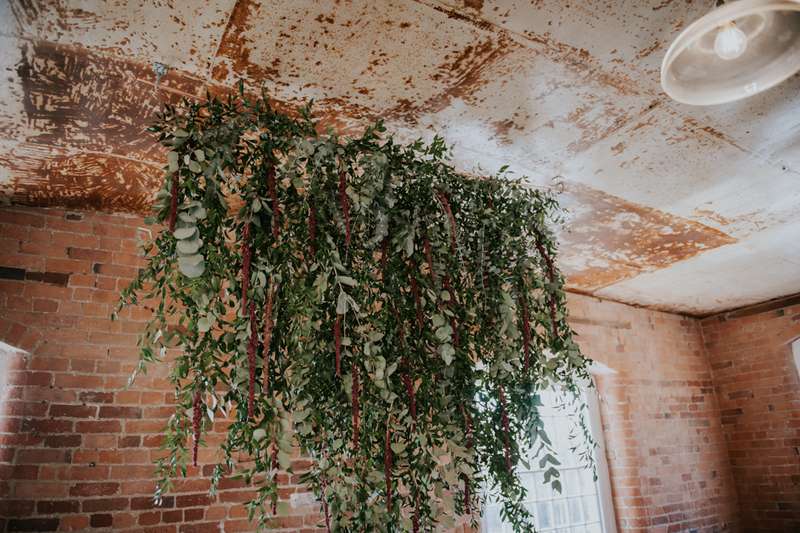 Both the decor and fashion were minimal, but oh my did they have maximum impact. Bride Lol’s bespoke backless gown in particular is the epitome of chic and proves the statement ‘less is more’ sometimes couldn’t be more appropriate. The bridesmaids looked just as elegant in their white gowns, with their bouquets of foliage popping against the crisp hue. 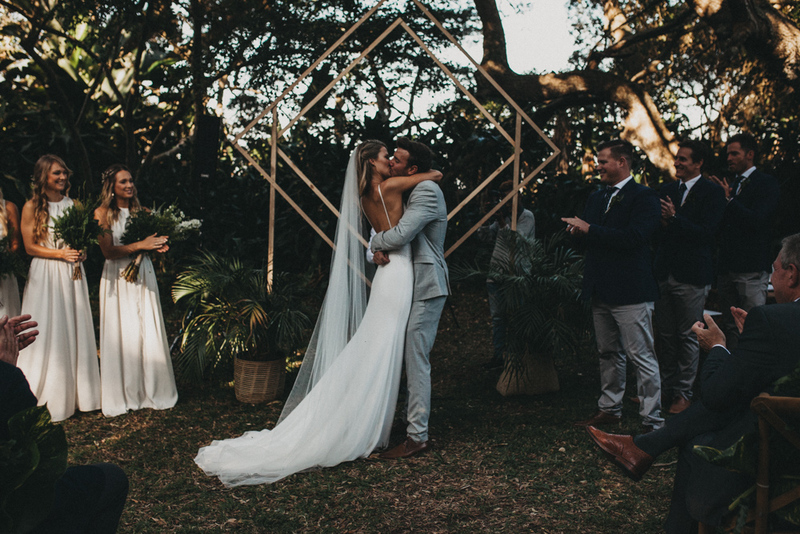 Starting with a gorgeous woodland ceremony with a fabulous geometric altar framing this wonderful couple as they say their vows and culminating in what looks like ‘the most’ beautiful and fun reception EVER in a glass marquee, with all the emotion captured perfectly by Michigan Behn Photography. 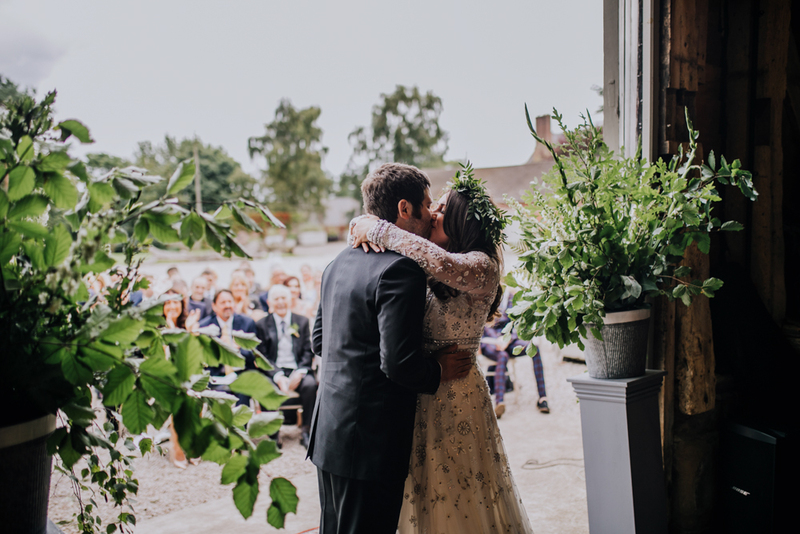 Come with us and escape to the gorgeous Oxforshire countryside for a late Spring wedding at Soho Farmhouse, because believe us you won’t regret it. 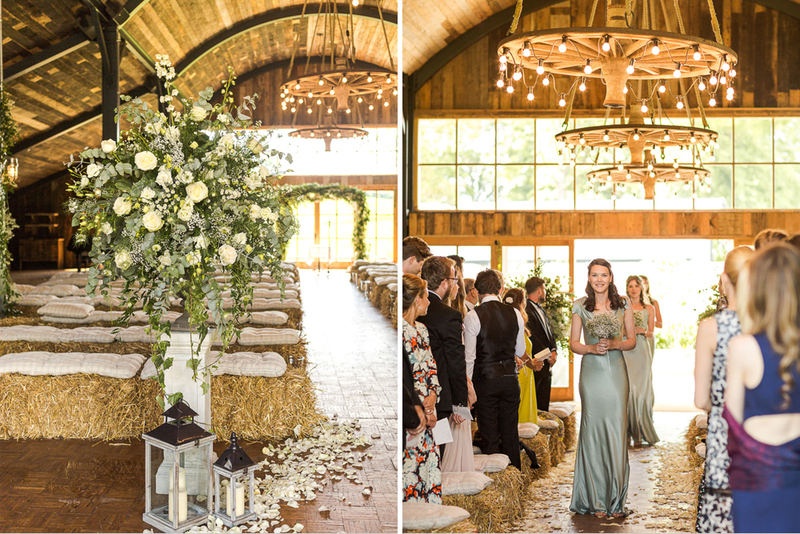 After travelling a short distance by horse and carriage, the bridal party arrive for a delightful barn ceremony with hay bales seats and cosy hanging light installations, It is then swiftly followed by a stunning PapaKata Sperry tent reception, all adorned with the lush greenery foliage and white florals. Bride Anne looks heavenly in a Mira Zwillinger gown with delicate embroidery that glimmers beautifully in the light, and the pale mint shade of her bridesmaids Ghost gowns couldn’t be more perfect for the theme. 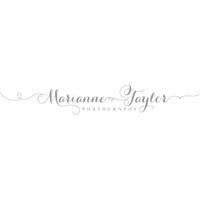 Marianne Taylor Photography really has captured the essence of this gorgeous day. So make yourself comfortable and enjoy.